Have you ever wondered whether those $170 Shure headphones are worth the pricetag? Or just what people can come up with at Build-a-Bear? 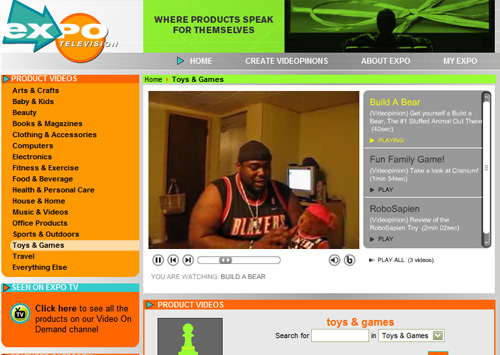 Expo TV's professional product demonstrations and reviews contain lots of helpful information, but it's the consumer-produced Videopinions that really make this site addicting. I can't find a Spacebag or George Foreman Grill video, but I'm sure it's just a matter of time. Expo TV is truly a great reinvention of the infomercial format - turning consumers into producers and marrying the interactivity of the Web. With literally hundreds of product-specific videos, this is certainly one of the most sophisticated uses of the Brightcove service that we've yet seen.